Bumpy roads, mutton food, incredible skies (day and night! 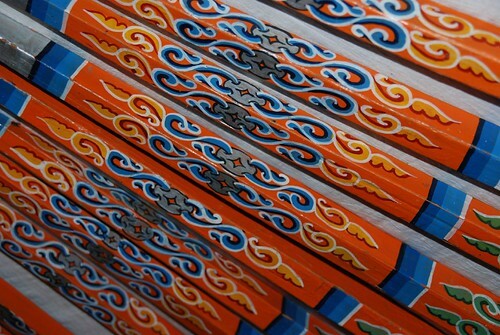 ), fantastic landscapes, sleeping on a bed made of some wooden benches and Chinggis Khan! While travelling in Mongolia, we noted the presence of blue silk cloths hanging everywhere: in temples, around people’s neck, along the dirt tracks (speaking of roads here would be highly exaggerating) attached to stone pyramids and even in the Mongolian state emblem. 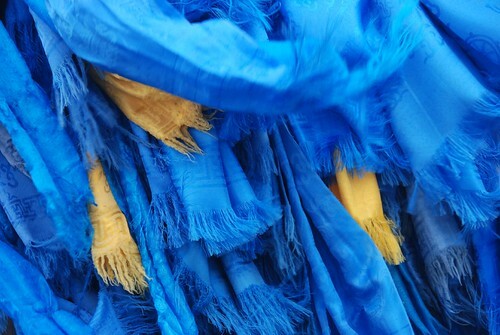 The blue silk cloth is known as hadag it has an important meaning for the Mongols both in its use and by its colour. Motivated by both Melanies (yep, one from Germany and the other one living in Guadeloupe) we decided that it was maybe time to revive this picture in the picture category again. After all it is nice even for us to travel with help from our pics and we do realize that we really have a story to tell for each of them. Today we want to talk a little bit about yurts. During our time in Mongolia we decided to go on a tour to see the country. Mongolia is vast, there is only one official road connecting the current capital, Ulan Bator with the old capital, Karakorum. All the rest of the roads are “dust tracks” that are impossible to get along on, except if you have a sturdy old Russian jeep and a driver who for some reason knows that if he meets this one particular bush that is opposite this one mountain and with the sun setting over this one sandhill, that he has to make a 90 degrees turn to the right. In other words: it’s impossible to know where to go as everything resembles; all the bushes look the same, as do the mountains and the sandhills, but those drivers “just feel” where to go and during our 12-day trip we never got lost and always found some yurts to sleep (although, to make it even more difficult, Mongolian people are nomads, so those yurts move all the time too). If you think that Mongolia is all about arid areas, without water and without trees, then you think exactly like we did before we went to Mongolia. But you know what? You’re wrong! Mongolia actually has quite a lot of lakes and quite a lot of forests to explore. That’s what we did on the second part of our tour: the one in the direction of the old capital: Karakorum and towards the White Lake National Park. On the 29th of August we left Irkutsk by train for the capital of Mongolia: Ulaan Baatar. We were quite excited about it, because going to Mongolia had been a thing we had been dreaming about for many years.